Japanese designer Mikiko Endo lets her wild imagination go to work—–so we can play. 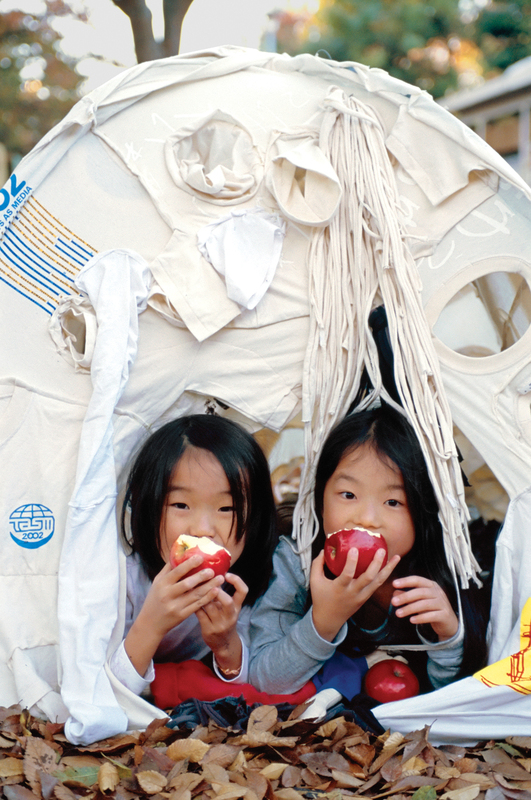 Old T-shirts become new tents in Endo’s Ka Me Ki Chi project. 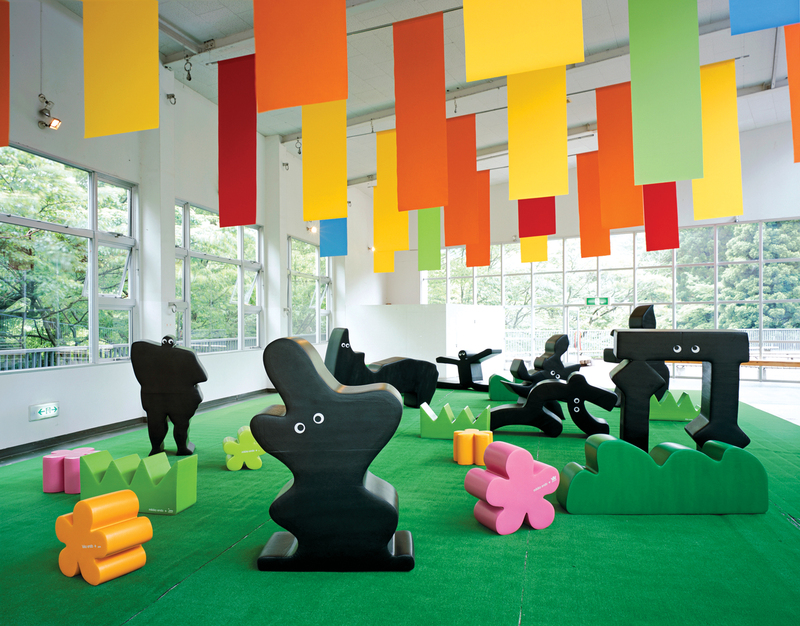 Fuwa-Fuwa sculptures mimic fun-loving shadows at the Hakone Open-Air Museum. 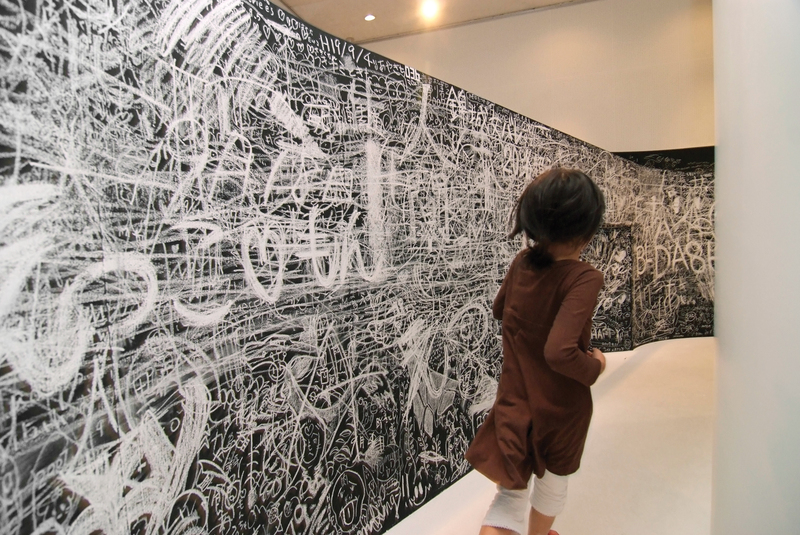 Mr. Loop—–a winding blackboard—–wraps around the room at another Hakone exhibit. From a tiny two-person office in Tokyo, the multitalented Mikiko Endo designs Japanese houses and maternity clinics in Zambia, runs woodcutting day trips in the forest, and conducts art workshops to raise money for HIV-positive families. The 40-year-old mother of one is best known, however, for her elegantly wacky play spaces: from a children’s clothes shop masquerading as an enchanted forest to a giant spiraling blackboard that trans-forms adults and children alike into chalk-happy maniacs. You started designing for kids as an architecture student in the Netherlands 11 years ago. Why? I was forced into it! I used to take my daughter [a toddler at the time] to the park, but I’m a bad mom and I’d get really bored. So I started to do design research for my thesis there. How can I make the park cuter? How can adults enjoy themselves too? How can I bridge the gap between life and architecture? So what does work for all ages? Kids and adults both like things that are giant, extreme, and surprising—but also very simple. In my Hakone Art Loop installation I wanted people to feel they’d turned into artists. That doesn’t happen in a familiar space, so I installed a blackboard that reached to the ceiling in some places, almost like a monster. We found drawings on it twelve feet up. The gallery manager said they could have been done by a grown-up who got up on another grown-up’s shoulders to draw. How do you get into that childlike headspace yourself? That kind of project is half art, and making art is like taking a trip to an imaginary world. I read books, spend time out in nature, listen to music, play the piano. There’s no risk these days. You’ve got to eliminate hazards, of course, but kids will learn to protect themselves. I think there should be some dark places. Mozart. His music is so simple and beautiful, like a sparkling star. I aspire to work like that. My first project was an indoor play-park with a tunnel-maze. I made the outside very flashy and photogenic because I wanted to get good reviews, but the inside of the maze was plain cardboard. When my daughter tried it out, she said to me, “Mama, you’ve got to put a bell or a prize at the end of the maze. If you just make the outside look good, you’re tricking people.” Kids are so honest. I really learn a lot from them. As an architect, I use wood all the time, but I didn’t really know where it came from. I was like a cook who only knew about cut-up fish from the supermarket. [When I went out to the woods to cut timber for a recent project] I felt like I’d learned the shape of the fish for the first time. I like to take walks in the park with my daughter and talk to the trees—we give them names, and decide which ones look like people we know. I also started ice skating lessons. It’d be great to learn to jump at this age.